Love to experiment with various cuisines, if i have a chance to make a world culinary trip am ready to go immediately without any second thought. Yes am a foodie and am very proud to be. Since i dont have any chance either now or in nearby future i'll make myself happy by preparing dishes from various countries at home itself. My small kitchen is the only place in my home helps me a lot to dish out different dishes whenever i feel like experimenting with new cuisine. You may see already that i have tried many cuisines from all around the world and its been quite a routine for me to make different dishes out from my South Indian roots whenever time permits.Few of my culinary experiements have turned diasters especially when its from African cuisine. This cuisine is not that much familiar for me but East African dishes have an Indian touch and many foods cooked there have similarities with our Indian foods. The main reason behind this is because of Indian immigrants, East Africans eat chappathis, their chicken curry ressembles quite like our Indian chicken curry, they have their pakoras as much as like ours. Obviously whoelse will wait to give a try to this cuisine. 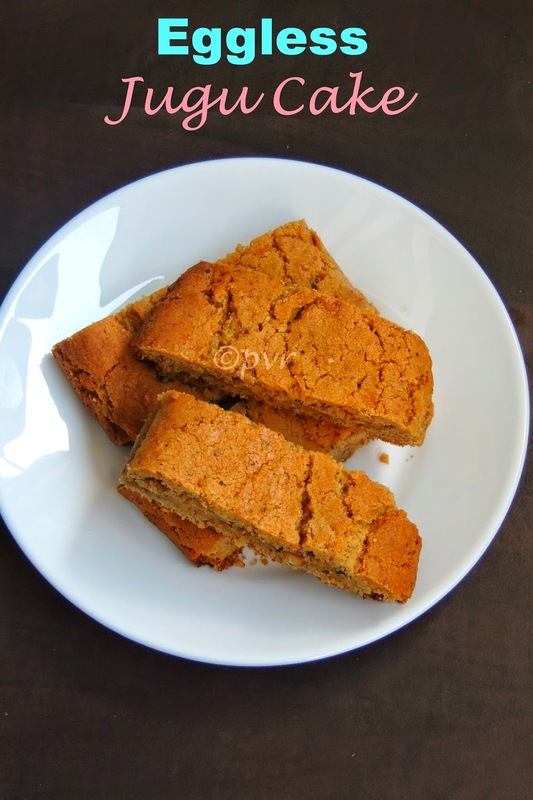 One of my recent trial from East African cuisine is the Eggless Jugu cake, this cake aka biscotti type of baked biscuits goes for the famous roasted peanuts. Usually Jugu cake is prepared with eggs, since i want to give a try to an eggless version, i replaced the egg with flaxseed meal, this worked wonder. Actually once this eggless jugu cakes gets baked, i wasnt happy to see so many cracks on the top, honestly i was bit anxious. 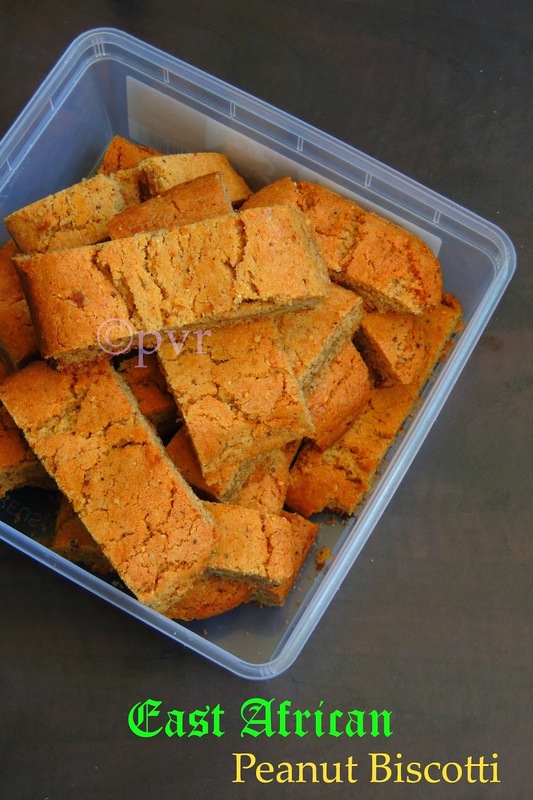 But once well cooled i sliced them carefully as i dont want to crumble the cake, trust me once they were completely cooled, you can slice them either small or medium sized biscottis without any hesitation. Personally i didnt missed the eggs here, peanuts plays the major role in the cake and they are soo addictive, you cant just stop with one. After Thailand, this month's challenge of International Food Challenge ,a monthly event started by wonderful food blogger Sara,we are landing towards East African Cuisine, the host of this month is Ramya of Lemon Kurry. She suggested couple of East African dishes, i picked this jugu cake from the list and loved it to the core. Mix the flaxseed meal with warm water,keep aside. Grind the roasted peanuts as bit coarse mixture. Take the grounded peanuts, flour,sugar, baking powder,flaxseedmeal mixture, butter,baking soda in a large bowl. Mix everything to form a crumble like mixture. Gradually add the milk and make a soft and pliable dough. Divide the dough into four balls, roll them as medium sized logs, arrange over a baking sheet lined over a baking tray. Slice it as your desire, conserve them in air tightened box. G'day! This looks delicious Priya! I wish I could come through the screen and try some now! Wow aks appadiya parcel that box ;-) semma tempting. looks so yum! nice tea time snack .. I too tried this and these are seriously addictive Priya..My kids too enjoyed it..Your jugu is perfect and dragging me to try it again.. Thanks for trying and spreading the word.. I like the addition of peanuts to the cake..The eggless version is interesting..
jugu cake looks delicious, but never heard of it as been a popular dish in East Africa. I could have that whole plate! So tempting!